AXIS FM program is assigned to cooperate with AXIS FA, FB, FC and FSA force meters. The program enables readout of measurements from force meter on-line (while the force meter is working) or off-line (after earlier collection of measurement results in device memory). 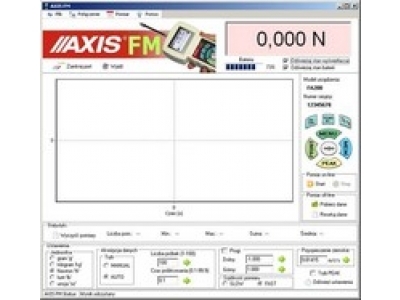 Moreover from AXIS FM level the majority of settings essential for measurements, saving them and saving diagrams is available. To change program language version click on the english flag at the top of program window.